Global financial services provider PayPal has launched a new feature in its popular mobile phone application, which enables restaurant customers to pay for their meals from their tables when they eat out. PayPal Australia said the new feature removes the need to flag down a waiter or leave the dining table to pay at the till. With one in four PayPal Australia transactions now taking place on a mobile device, the Pay at Table option allows PayPal to check into a restaurant on their mobile, enter their table number and then pay their bill. It even gives customers the option to enter a tip. The announcement of the new feature comes as new Europay, MasterCard and Visa standards are set to come into effect in August 2014. Under the new industry wide move to expand Personal Identification Number (PIN) use at the point of sale (POS), Australian consumers will no longer be able to sign for transactions or hand over their credit card and sign the payment slip. “Not only are customers going to have to adapt to the new standards, but restaurants and cafes will need to look for solutions at the checkout that are going to simplify what is destined to be a complicated payment process for both merchants and customers,” said Andrew Rechtman, Senior Director of SMB, Retail and Strategy at PayPal Australia said. “The Pay at Table feature delivers a tailored solution that gives restaurants and cafes direct access to over 5.5 million account holders using the PayPal digital wallet online, on-the-go and in-store,” Mr Rechtman said. Robert Gugliotta, owner of the Bravo Trattoria restaurant in Sydney said the Pay at Table feature had saved his staff time and allowed them to focus more on customer service. “PayPal’s Pay at Table is a cost-effective solution for my business that has negated what would have been a substantial investment in new fixed terminals or mobile upgrades to comply with the new standards,” Mr Gugliotta said. PayPal Australia said its cashless and mobile wallet payment options processed $27 billion globally in mobile payment volume in 2013, up almost 100 per cent from 2012. 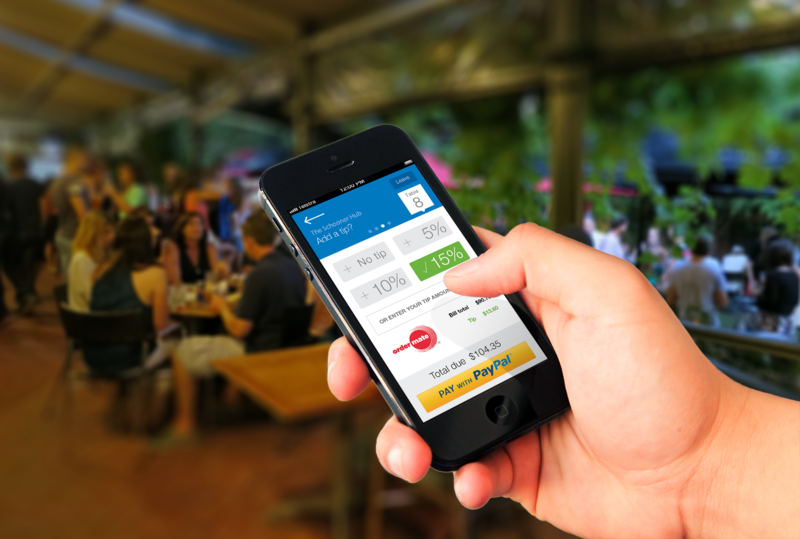 According to PayPal Australia, hundred of Australian cafes, bars and restaurants are already using the PayPal app, offering customers an ‘Order Ahead’ or ‘Check-In’ feature that allows customers to easily order and pay using their digital wallet. “With research indicating almost 3 in 4 Australians own a smartphone, consumers are increasingly turning to their mobile phone to pay for everyday goods and services,” PayPal Australia’s Mr Rechtman said. “The new Pay at Table feature is just one example of how PayPal is investing in technology to simplify the payment process for restaurants, bars and cafes around Australia,” he said. Australian Food News reported in October 2013 that supermarket group Coles had launched a consumer trial of ‘contactless payment’ technology called the Coles Pay Tag, with 5,000 mobile phone tags available nationally. The Coles trial enabled a sample group of 5,000 customers to pay with their credit card and earn Flybuys points by using a Coles Pay Tag attached to their mobile phone. Australian Food News also reported in January 2014 that Australian mobile phone technology developers had launched a new mobile phone app called ‘Beat the Q’, that allowed consumers to order ahead and pay for their takeaway coffees with a credit card or PayPal account. Bulla is now selling a ready-to-decorate ice cream cake base.